There’s simply no other neighbourhood in Singapore like the east. Your home in the city, Park Place Residences brings the best of Singapore to your doorstep with unprecedented connectivity near and far. Paya Lebar Central will be a new growth area and Paya Lebar Quarter is in in the heart of this transformation. 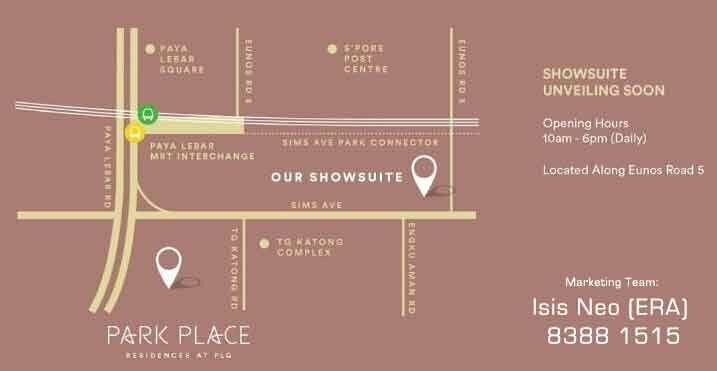 Situated at the junction between Paya Lebar Road and Sims Avenue, this prime retail destination with a retail mix geared towards mid-to-mid plus retail and entertainment options, while the residential block, Park Place Residences at PLQ will be part of it. Over 340,000 square feet (NLA) of retail experiential park-side dining, 6 floors plus a floor with cinema and other entertainment to offer. It will also comprise of another 3 grade A office towers with circa 900,000 square feet (NLA) of best-in-class office space complemented by high quality retail and public amenities to maximise workplace efficiency and productivity. Here will be a bustling, integrated commercial centre with offices, retail and attractive public spaces flowing with activity. The location of Paya Lebar Central has great potential to be a destination commercial hub. A mere 10-minute drive from the CBD, Paya Lebar Central is near to major expressways (PIE and ECP) and major roads (Sims Avenue, Paya Lebar Road and Changi Road). A mixture of land parcel sizes will be available to cater to different commercial needs. The larger developments will be grouped around the junction of Tanjong Katong Road and Sims Avenue to anchor the area with retail and office developments. Paya Lebar Central is planned for the convenience of pedestrians, right from the point when you arrive at Paya Lebar MRT interchange. Covered walkways, underground walkways and overhead bridges will all help to make the neighbourhood a breeze to walk through. Getting to popular destinations on Geylang Road, like Geylang Serai Market, will be quick and comfortable. From Paya Lebar MRT interchange, pedestrians can simply cross a plaza and walk through the shopping galleria leading to Geylang Serai Market. On Geylang Road itself, the new pedestrian mall will be an easy route if you want to take in the sights. Shops, outdoor kiosks and cafes will spice up the walk – especially when the mall teems with temporary bazaar stalls. With the completion of the Marina Barrage in 2008, water levels in its catchment area – including Geylang River – can stabilise. This presents an unprecedented opportunity to integrate the River with future developments, creating attractive public spaces in Paya Lebar Central. A newly reconstructed stretch of Geylang River will take centrestage within a new commercial development along Tanjong Katong Road. Here, a mix of offices and shops will bring life to the riverbanks. Picturesque landscaping juxtaposed with the waterway will create a soothing River Walk. Stroll from shop to shop, grab a bite or take a romantic stroll. Pedestrian walkways along the river will ensure that this delightful River Walk is open to all. Easy access to major expressway with MRT station consisting of 2 major line, shopping mall right at your door steps. Paya Lebar versus Jurong: which will be the hottest business hub? About 30 years ago, if you bought property in Jurong, people were not sure whether to laugh at you or send you their condolences. 1980s Jurong was more underdeveloped than a 13 year-old’s Tumblr poetry, and 90 per cent of it was smog, industrial grade machinery, and overloaded trucks. Then there was Paya Lebar. No one really remembers what it was like 30 years ago. In fact, Paya Lebar was so boring for so long, it’s possible the Singapore government was caught entirely by surprise when they looked at a map and realised it existed. I think that right up till the ‘90s, the most exciting recreational activity in Paya Lebar was measuring nose hairs, and seeing which one grew the longest before you died of old age. My point is, both places were invisible on the property radar. Then came the business hub plans.